There is a national debate underway about the regulation of health insurers and insurance benefit standards. To reduce regulatory burdens, the Executive Branch enacted changes that weaken essential health benefit requirements, which require coverage of mental health and substance use services. The Executive Branch has also proposed regulations that will expand the availability of health plans that can discriminate against people with mental health and substance use disorders. This political position puts vulnerable Americans—especially those with mental health and substance use disorders—at risk of losing access to much-needed health care. NAMI recently collaborated with researchers at Georgetown University on a report that provides, for the first time, comprehensive data showing barriers and gaps in mental health and substance use coverage in the individual insurance market prior to the Affordable Care Act (ACA). This report highlights just how bad things were and emphasizes the dangers of turning back the clock. 28 states did not require individual market health insurance plans to cover or even offer mental health services. Health plans looked to avoid enrolling individuals with mental health or substance use conditions by screening applicants. Even when individual market insurance was accessible, insurers effectively fined people with a history of mental health or substance use conditions. They did so by applying a 20–50% increase in premiums while also excluding needed mental health and substance use services. Insurance plans used lifetime caps, limits on outpatient visits, limits on inpatient days covered and restricted access to prescription drugs. The ACA changed coverage of mental health and substance use treatment in the individual market. Insurers had to expand coverage and remove dollar value and visit limits. If these protections are weakened, insurers will likely return to their old practices of excluding or limiting mental health and substance use treatment. 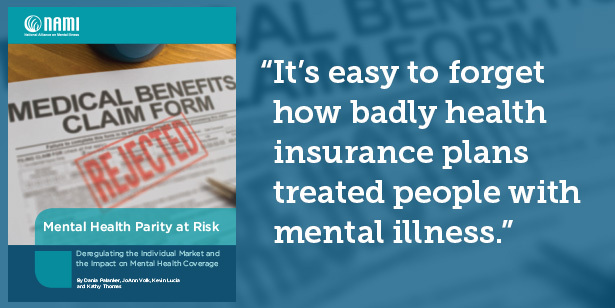 This report highlights what’s wrong with returning to an individual insurance market that lacks federal mental health and substance use benefit requirements. The bottom line: We cannot go back to a system that discriminates against people with mental health and substance use conditions. Tell us your story. Share how insurance coverage for mental health treatment helps you, or tell us about challenges you’ve experienced—now or in the past—that have impacted your ability to get mental health treatment.